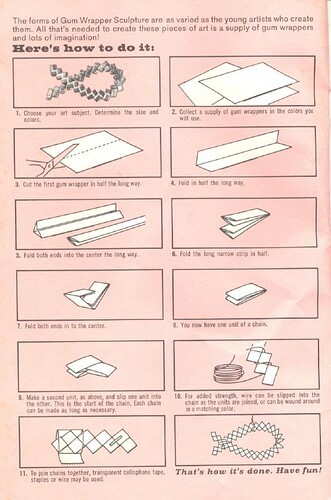 Wrapper Purses has detailed photos on how to fold and construct rows of woven paper which are then sewn together into a purse. She used potato chip bags. Candy wrappers are also a popular choice. Mylinda’s instructions were very helpful, but there are some tricks you learn as you do it that are hard to describe online. If you want to try this technique yourself, her blog is the place to start. She also lists several organizations and businesses marketing purses made using this technique and has some great photos of purse examples. Between these two blogs, you should be able to make your own purse. Like all good things, making a purse like this takes time and lots of it! I’m estimating mine took about 40 hours. But, there was a learning curve there, too. It’s a mindless operation for the most part, a good way to keep my hands occupied when I was too mentally fatigued to do something that needed some thinking. I sat in the kitchen folding and folding while I listened to a book on tape. The wallpaper worked well in the sense that it folded easily, was sturdy, didn’t crack and was pliable. The problem is the thickness. Although I think the purse resulted in a gorgeous product, it’s not the best functional piece in terms of weight. I have not seen any other examples that used beads. For my piece, the beads added texture, depth and really finished it off. The white ones are carved ostrich egg shell and the dark ones are coconut shell, both from Africa. They are held in place by clear glass seed beads. I start out by cutting the strips on a mat. I used a rotary cutter to try to go through the task more quickly. I have been using dog food bags since I made that first bag, cutting strips measuring 4.5″x 2″. If I make another wallpaper purse, I will make the strips slightly bigger. It’s amazing how many strips you need to make a purse! I kind of lost count, but am estimating that Snow, the dog food purse, used up six of the biggest dog food bags, four medium ones and two small ones. It may have been more. I estimate I used at least 500 pieces for snow. Once I had a big stack of them cut up, I separated them into color content, not easy to do on bags that have a lot of images and text. The strips are then folded. I fold down the middle to get a crease, open it up again and then both sides down to the middle again, ending up with a long skinny piece. Then each end is folded once more to the middle. These are the links. The trickiest part was figuring out how to join the ends to make them into a circle. You have to undo the last one, weave it in and fold it back into the piece to make it work. Then, the two circles are held side by side and sewn together. I use dental floss or gut to sew. You weave the needle back and forth under one of the layers to secure them. First I do the outside and then go around a second time on the inside, helping to make the bag strong and balanced. Taking care in color combinations keeps the design from becoming too chaotic. I covered this purse with white buttons. I think I am the first person to use embellishments in this way on these purses. At least, I have never seen anyone else add to them with the exception of zippers or closures. The added texture makes the bag for me. There are many variations of this on the market and I have seen very cheap bags coming from Mexico or Asia. But, remember that the size of the folded piece matters. The smaller they are, the more work is involved. I have now made quite a few of these bags, a hat (!!! ), a couple of cuffs and each one is a puzzle with great results! How about you? Have you made any? If you have some links we can look at, leave them in a comment! on Candywrapper Weaving Technique and Tutorial. Thank you for the tutorial. I’ve been working on trying to make these purses. When I sew my links together they’re no tight enough. How can I fix this to where my purse looks like yours? Do you think that is the problem? Is your paper too soft, Dana? Yes, I believe that is my problem. I will followup with you after I try this😊. I think that if that was the problem, you will be fine. Figuring out how to close the bags and adding handles are challenges, too, but you just have to experiment… Have fun! It’s in German, but the images clearly show what to do. Much better than the ones I took!